Harstad, Johan 172 Hours on the Moon, 351 pgs. Little Brown Books for Young Readers, 2012. Language - 10; sexual content - PG; Violence - PG-13 (mostly off page). NASA holds a lottery to pick three teens to travel to the moon on the first visit there in decades. But something is hiding on the moon, and there's no one to save them when things go wrong. The first half I found a little boring because I thought it had too much information on the teens attending and their reasons for wanting, or not wanting, to go. Once they leave for the moon, the action picks up and it gets really creepy. 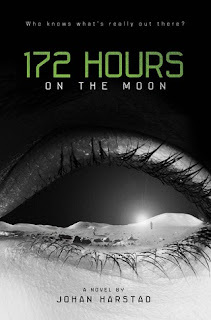 I was disappointed because all the action on the moon takes about 20 hours, and I was promised 172, so it felt rushed. The ending was pretty cool. Though sort of confusing and unbelievable even in the context of the story. Overall an okay read.